Last week we took a slight break. Since we were in Indiana with friends it was a little hard to figure out when to “sneak in” a long run. I was still banned from running on any solid surface so it was nice that I had a good excuse not to run. Jason only had about 55 minutes to run so he took what he could get. I think our break was good for Jason at least. Tonight he had an 8 mile tempo run that he decided to do outside since it was so nice today. He was smoking!!!! 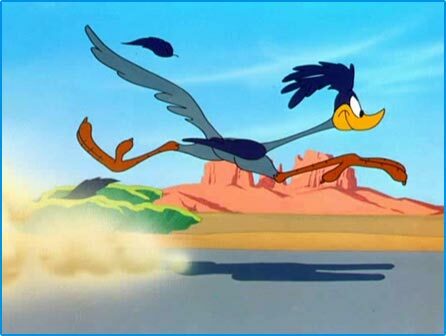 Road-runner fast!! He averaged 8:03 min/mi for 8.4 miles. He is continuing to improve with each week. That is the reason he really likes the training program he is doing. We are getting excited about the marathon! I am still crossing my fingers hoping my body holds up. Nothing hurts at all right now, but we’ll see how it goes after my next really long run this coming weekend. For now–I’ll just be glad that Jason is doing so well! ~ by legmaker on March 20, 2008.
the 8 min mile is most impressive! !